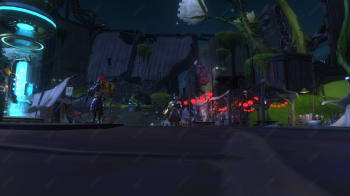 Carbine Studios currently holds a 2.5-star rating on Glassdoor.com, with former and current employees anonymously complaining about management problems at the Wildstar developer. Update: We have spoken to a former Carbine Studios employee on the condition of anonymity. The employee's account didn't echo the major concerns of poor management and workplace toxicity shown in the Glassdoor reviews, but did say this about the environment: "When you have key people who leave, it leaves a void." In August of this year, Carbine's President stepped down for health and family reasons, and "when a studio head leaves... commitment and passion leave with it." In regards to recent layoffs, the employee acknowledged that "workforce reduction" is an unfortunate but unsurprising occurrence in most industries. "Once the game goes out the door" it takes less people to maintain than it did to launch, hence the frequent layoffs in gaming. The anonymous employee enjoyed the time spent at Carbine Studios, and said "Just like any other job, these are things that happen." Original story: Layoffs are a sad reality of any profession, but it seems they happen far too often in the video game industry. Last month, NCSoft's Carbine Studios cut 60 employees from the MMO developer, which was explained as "a restructuring of key operations within NC West." As expected, former Carbine employees are hitting job-finding websites like Glassdoor.com, the mission of which is "to help people everywhere find jobs and companies they love." It appears that some former and current Carbine employees would not define the studio as a "company they love," as its page has been flooded with negative reviews criticizing the management, toxic environment, and lack of communication, among other things. -Abysmal wages, morale, and job security. -Inability to put the word to the deed: deadlines routinely missed, poor quality assurance, sweatshop workplace conditions. Many of the negative reviews were quick to praise their coworkers and even the MMO Wildstar, which launched in June. One of the most positive comments, a four-star review, listed the free snacks, benefits, and laid-back work environment among the pluses, but still listed management and communication as negatives. As for the employees' advice for management? "Fire yourselves," "stop making plans to make plans," and "listen to your developers" are among the suggestions. As of this writing, 41% of reviewers would recommend Carbine Studios to a friend as a good place to work, 40% approve of its CEO, and 39% have a positive business outlook. Out of five categories that factor into a company's rating, Senior Management ranks the lowest with 2.1 out of five stars. Distribution shows two-star and one-star reviews outnumber higher rankings. We will be reaching out to Carbine Studios and will update if and when we get a comment on these claims.